In a previous post, I wrote about discovering a new website that I was extremely excited about: addicted2lipbalm.com.au. I am the kind of person that cannot leave the house without lip balm. I have them scattered everywhere all over the house and about two or three in my handbag at any given time. If I find myself in a situation where I don't have any on me, I will make it a priority to get to the nearest store to buy myself one. Yes. I need lip balm! I wouldn't say I'm obsessed with them, because to me they're just a normal part of my life, such as breathing. It's just a given that I'll use it. I've been using them since I was a child, when my mum took me to a doctor for my excessively dry lips (I think I actually had some kind of viral infection that required medicated lip balm, but I can't remember). I used to just apply Vaseline on my lips to keep it moist, but it wasn't until I started high school that I began to use flavoured lip balm. Remember Bonne Bell?! I had a tin full of them, my collection was quite impressive! 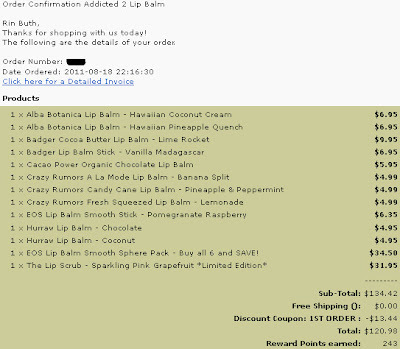 My experience with the addicted2lipbalm website has been positive so far. It's very easy to navigate and has a huge assortment of glosses, balms, scrubs and all lip things. They offer free shipping in Australia for orders over $50 and they also have a loyalty reward program. If it's your first purchase, you're also entitled to 10% off! 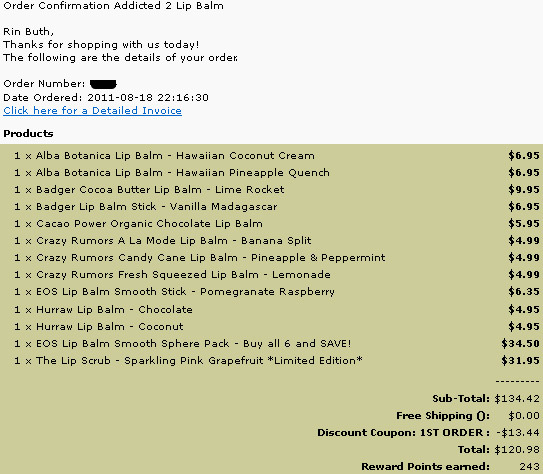 I love free shipping, I love loyalty programs, I love saving and most importantly, I love lip balms! So the moment I first laid eyes on their website, I knew I was going to order a bunch of products. The most exciting thing about addicted2lipbalm is that they stock brands that you wouldn't be able to find at your local chemist or Woolies. I have seen good reviews on the EOS smooth sphere lip balms and always wanted to try them, but didn't really know where I could find them. Problem solved... I've found them! In true lip balm fanatic style, I ordered the 6 pack containing all the flavours. I cannot wait to try them out! I had a really hard time picking only a few to try out. I'm into anything fruity or coconutty, and it has to be natural and organic. I don't like to use petroleum on my lips (it's basically the excess of crude oil, eww). I did order one product that wasn't listed under the organic range, and that was the limited edition lip scrub by Sara Happ. Hello! It's pink and it's limited edition. Therefore I have to have it! I don't mind that it's not organic as it gets washed off in an instant anyway. I am really looking forward to receiving my order. As soon as it arrives, I will post my haul and review some of the products. Watch out for it! I love A2LB, Leah is lovely and she has so many amazing products. You ordered some great balms, I'll be interested to hear what you think of them all when they arrive. Replica handbags cost more than anyone can afford low. They are very colorful, amazing, and versatile handbags. Today's replica handbags online is a symbol of love, love, and self-integrity world. That is why replica handbags are the most adorable fashion jewelry is now a woman. In fact, the prototype of the handbags will change the http://www.argos-us.com/search/results.asp overall personality, style, and fashion female behavior on the spot. Plus, the luxury designer replica handbags will build confidence, amazing dedication, motivation women's point. That is why replica handbags is often referred to prada replica as a feminist replica handbags. If you have an expensive phone to your hands, then you can put it into your replica handbags as a security effortless. If you have a lot of money in your hands, you can copy it into your wallet for a long time safety. Also you can put down a lot of accessories to your replica handbags long unharmed. In short, the bag is the most chanel replica fashionable clothing women are now women. More importantly, cheap replica handbags is in everyone's range at all.